Crime pays—specifically, it pays three gold to hire an Urchin. Like a board game you play to death then put on the shelf to bring out on special occasions, but with street urchins and priest-stabbing. It always happens. You're teaching someone how to play a cool board game, selling them on the theme, the clever rules, the sweet little wooden or plastic tokens. Then they ask, “How do you win?” And the answer you have to give them is, “By scoring the most victory points.” Suddenly that cool game sounds boring. So please stick with me while I describe Antihero, a turn-based strategy game about crime in the Victorian era. Two thieves guilds compete over gas-lit streets where the fog of war is literal fog. As guild leader you burgle buildings for cash or infiltrate them for long-term gain. The names of each inn or estate or orphanage are perfect, chosen randomly from a pool that mostly sound like medical conditions: Chiseler's Foot, Salty Navel, Lump Hammer, Grubsbush, Old Custard. Big-headed woodcut criminals, who look like characters from Don't Starve gone rogue, compete for control of those buildings and streets. Gangs scuffle in the gutters; Urchins commit blackmail; Saboteurs lay traps; Truancy Officers round up the Urchins. An estate might be guarded but contain valuable loot, a strangefellow club gives bonuses to Thugs and Gangs once taken over. And then, yeah, one player scores the right number of victory points and wins. It's more fun than that might sound. Victory points are earned by killing assassination targets, blackmailing churches, or buying bribes. However, bribes cost lanterns, which you also need to buy upgrades across three skill trees: skullduggery, sneakery, and stabbery. Skulduggery perks like Fine Ale increase the health of thugs, the sneakery perk Art Critic lets you steal paintings, and stabbery is of course mostly about damage. It's a tough choice because each bribe costs more than the last, and the price goes up no matter who buys them. Do you strengthen your hand with upgrades or grab victory points while they're still cheap? There's a little randomness in Antihero, and though even a little is too much for some people, it didn't bother me. The invisible dice control the placement of assassination targets (corrupt priests and fancy nobles who move around every couple of turns), and neutral Thugs who block streets. Business placement and burglary rewards are also random, though you're guaranteed a trading house within one move of the starting point. Occasionally you rob a house and get a lantern instead of the gold you needed to buy an Assassin this turn, but it's a minor inconvenience. Each map has something unique about it, usually an extra path to victory points: a masquerade ball that can be looted if you steal an invite; a ship at the docks that has to be held for a turn to get the cargo of; a palace that only opens if your Thugs hold the guard towers. These maps are arranged into an 11-chapter single-player campaign with comic strip cutscenes telling the story of a Thieves' Guild taking down its competitors one by one. It takes six or seven hours to finish. From then on it's all about multiplayer. 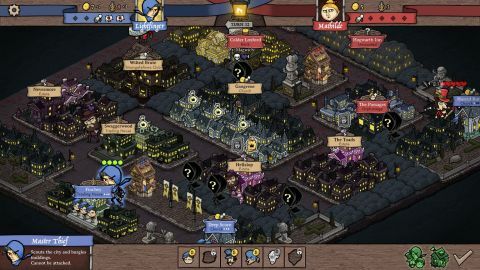 Antihero can only be played one on one at the moment, but there's both a hotseat mode with robust options for house rules and online multiplayer. Online it can be played live with time limits, or asynchronously over a few days. The game emails you notifications when it's your turn. The downside to going online is that, like many board games, after enough plays it becomes a solved problem. Everyone decides on the most efficient playstyle and sticks to it. In Antihero that means racing to level up a Gang, adding Thugs to increase its health and then killing the opponent's Gang so you dominate the map. (At first you can only have one Gang, and the upgrade to hire a second is all the way at the end of the stabbery tree.) The counter to Gangs are Assassins, so if you lose the Gang race the only option is to rush through the sneakery tree to unlock them. I've only played one match that hasn't gone the same way. Specific map objectives introduce only the slightest variation.